Data analytics can be applied to financial analysis in a wide variety of ways such as developing company goals and objectives, creating financial policy, evaluating economic trends, and more. Data analytics can give CFOs, financial managers, accounting staff and even purchasing managers reliable information they need to make critical decisions. Data analytics involves evaluating a company’s historical data to better understand the current and future financial health of a company. By tracking your financial performance alongside sales and purchasing data, you have access to your complete financial truth. For many companies, having data stored in disparate sources poses a challenge. Computer Weekly reported, “Almost three-quarters of financial professionals say they struggle to collect data from multiple sources and perform the analysis required to answer questions about corporate financial performance.” A data analytics solution such as Phocas overcomes this problem by combining the data from your existing financial solutions into one single source for analysis. Your data is then quickly and accurately presented for further interrogation. An important feature of data analytics is that it enables companies to determine how well they are likely to perform over time. Evaluating historical data alongside forward-looking financial statements can assemble a forecast that considers potential variations over time. Additionally, unlike the static reports used for accounting, data analytics offers dynamic analysis. This means a user can follow their train of thought and query the data for answers. A customized dashboard presents high-level summary information that the user can click on to drill down all the way to the underlying transactions for answers they seek. Data analytics works with ERP data and the information from income statements, balance sheet, and cash flow. In addition to these reports, Phocas displays financial data in trial balance mode so the user can see a list of closing balances on accounts on a certain date to help locate errors. With Phocas, a Profit and Loss statement can compare current to previous, current to budget, or current to previous to budget for greater insight. A customizable executive dashboard can present a wide variety of metrics, such as Return on Assets (ROA) to determine if you are using assets efficiently? Gross Profit Margin: This KPI tracks how much profit your company is generating on each dollar of revenue after all direct costs associated with manufacturing. The higher your Gross Profit Margin, the more income you retain from each dollar of sales. This KPI enables you to measure the efficiency of production. Operating Expenses Ratio: This KPI allows you to track and optimize your operating expenses by comparing the cost of running core operations to your total revenue. Changes to a company’s OER overtime indicates whether or not you increase sales without increasing operating expenses. Net Profit Margin: The Net Profit Margin is one of the most closely monitors finance KPI as it measures how well the company is turning revenue into profits. The higher the net profit margin, the better off you are. Any decline should be closely reviewed for issues such as unsatisfied customers decreasing their orders. Current Ratio: This KPI is a liquidity ratio that measures the ability to pay short-term obligations, usually over the next 12 months. The higher your current ratio, the better. Accounts Payable Turnover Ratio: This is another short-term liquidity metric that tracks how quickly a company pays its suppliers and bills. A high APT ratio indicates that a company pays its bills frequently, which is important when negotiating with a supplier. However, this also reduces the amount of available cash. Accounts Receivable Turnover Ratio: This ratio tracks how quickly a company collects payments. It indicates how effective the company is at extending credit. A low ART suggests the company should revise their policies to ensure timely collection. The higher the ART, the more liquidity is available to pay short-term liabilities. It’s essential that you choose a solution that adheres to international accounting standards (IAS1) that provides information in real-time, is user-friendly, has a customizable dashboard for dynamic slice and dice analysis. Phocas Software’s Financial Statements module is specifically designed to integrate financial data into Phocas — right down to the individual transaction level. Phocas’ Financial Statements is designed to be used by anyone. The permissions feature enables you to grant access to anyone, including your financial team, division managers, branch managers, purchasing teams and more. No longer limited by traditional reports, users have fast access to their data in real-time, from anywhere, so they can stay on top of expense issues and new revenue opportunities. 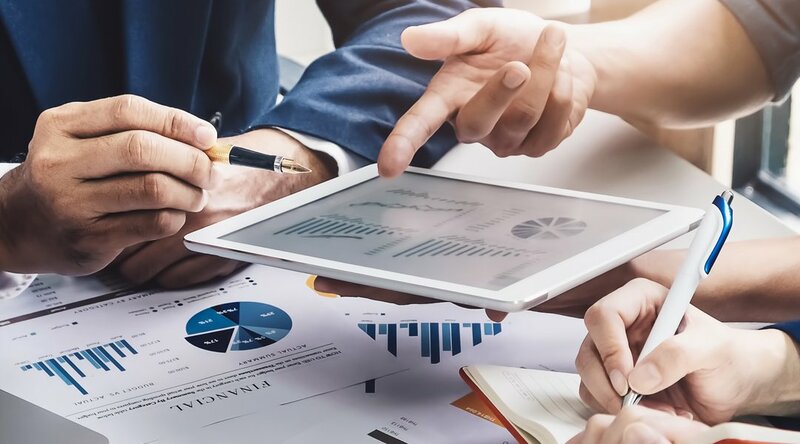 The ability to quickly generate and share reports enables finance leaders to quickly develop short and long-term strategies to continuously improve the financial state of their business. Click here for more information or the button below to view video about Phocas Financial Statements.